If you grew up in the Pennsylvania coal region, chances are you know what Boilo is. You have probably made your first batch by now. If like me, you did not grow up in the coal region, you probably have no idea what Boilo is. You are about to find out. 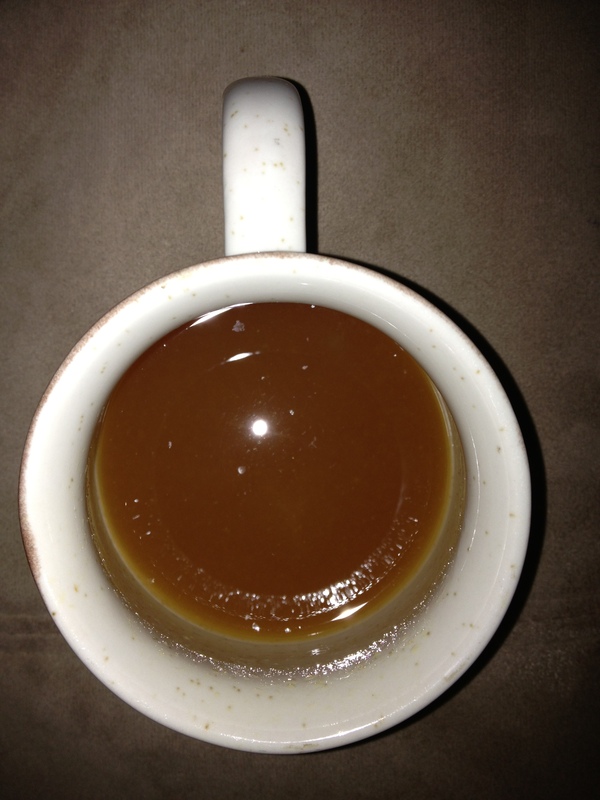 Boilo is a traditional drink made in the fall and winter to warm you up. Cold? Have some Boilo. Cough? Have some Boilo. Sore throat? Have some Boilo. Or? have some Boilo for no reason at all. 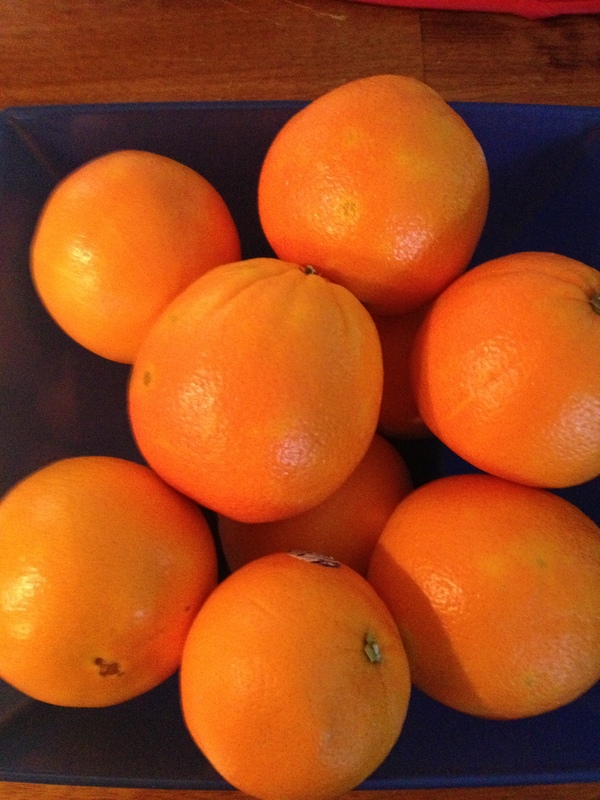 Boilo starts with about ten oranges. 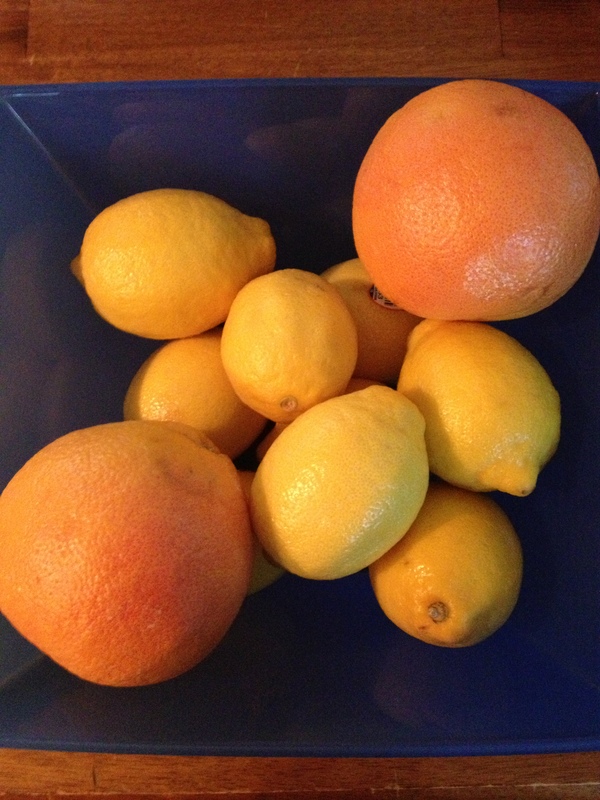 To finish out the citrus, six or eight lemons and two grapefruit. 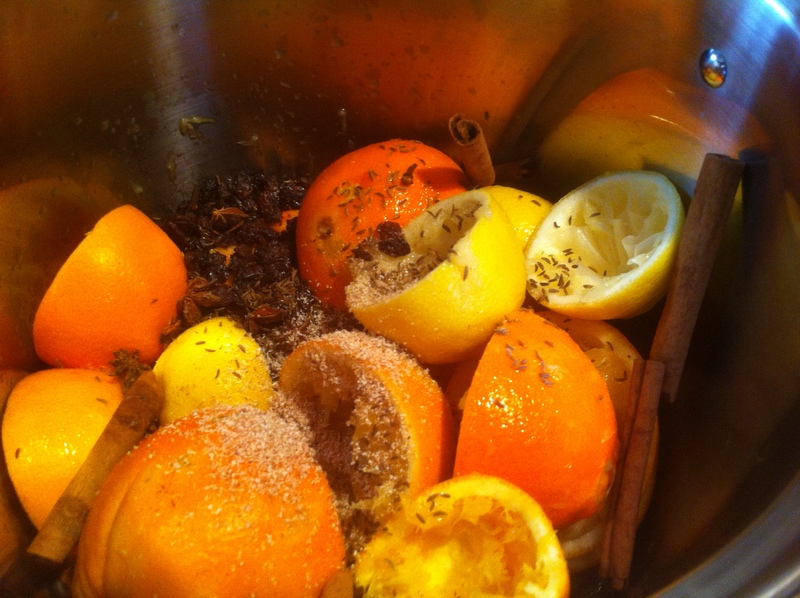 Traditionally, it is just the oranges and lemons. 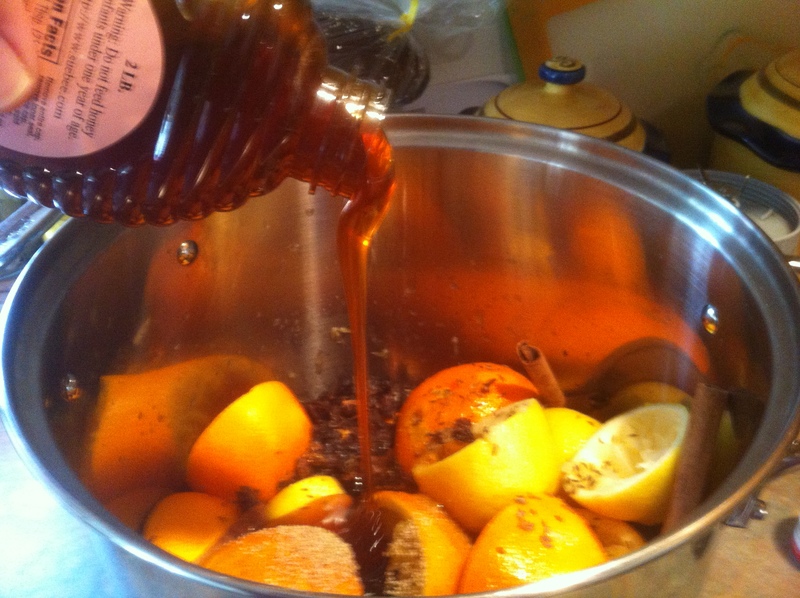 Last year we added the grapefruit and really liked it so we decided to add them this year too. 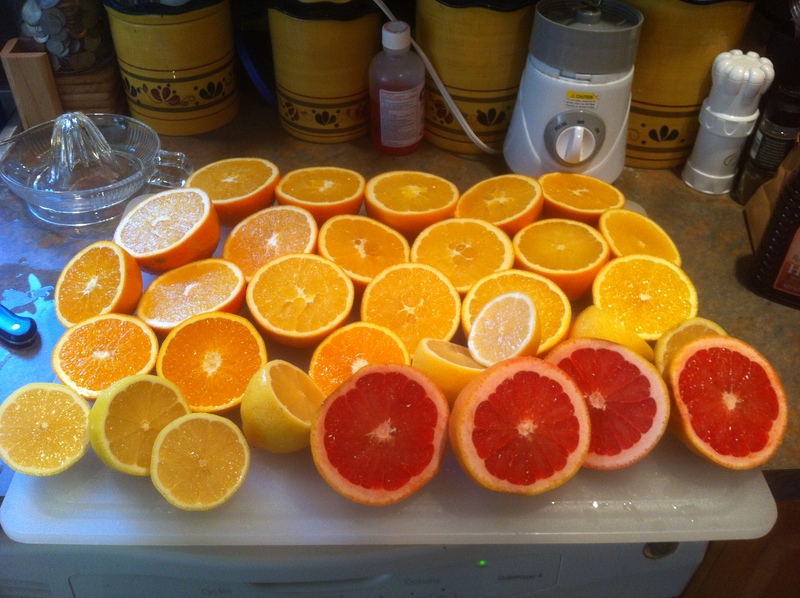 Wash all the citrus well and cut in half. This is where the work begins. 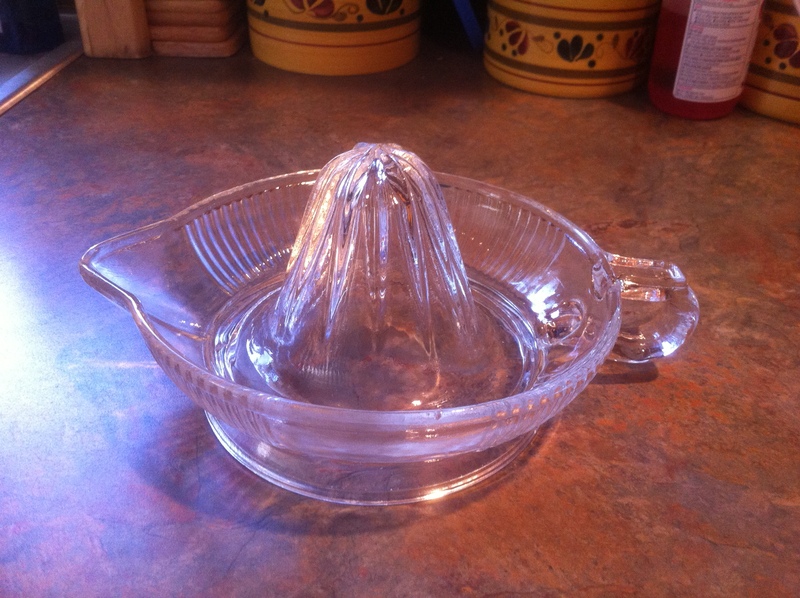 Check out this cool old-fashioned juicer we found at the farmers’ market! This is the time of year it gets the most use. Juice all of the citrus. Make sure that you really get out every last drop! 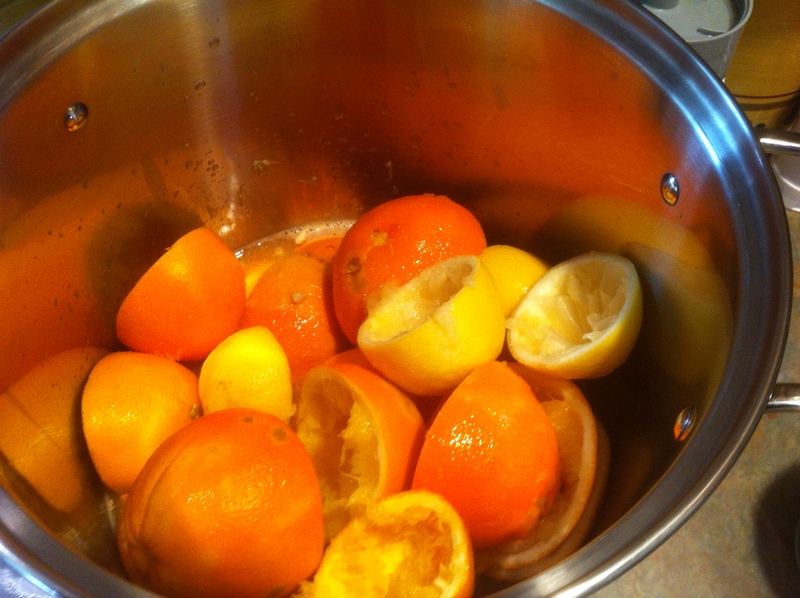 The citrus and all of the juice go into a twelve quart stock pot over medium-low heat. More ingredients. 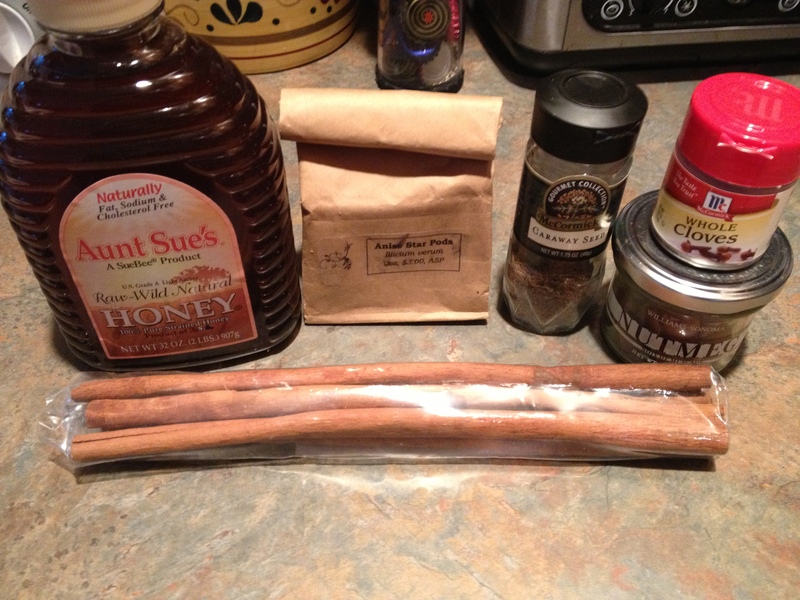 Honey, star anise, cinnamon, nutmeg, whole cloves, and carraway seeds. The last of the ingredients is raisins. 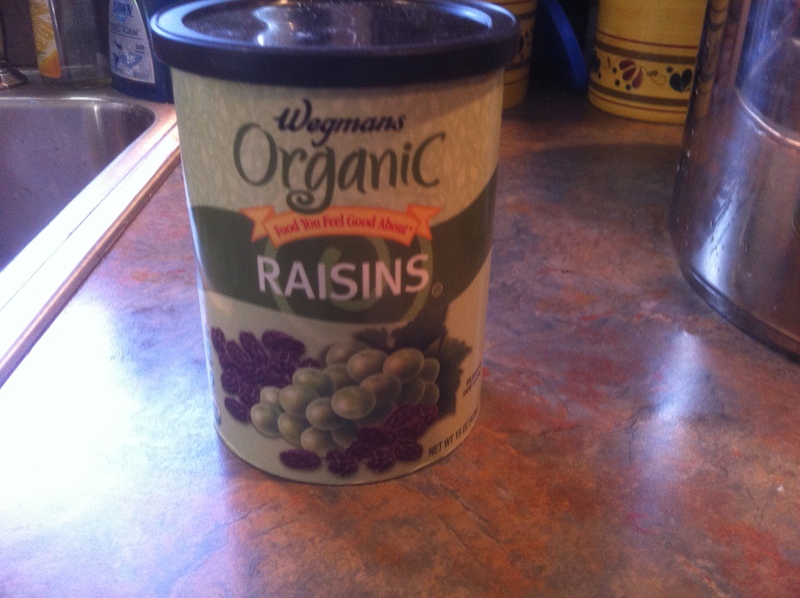 You can use regular or golden raisins. We have used both with the same delicious results. Add four cinnamon sticks, three teaspoons of whole cloves, five or six star anise pods, a generous sprinkle of carraway seeds, and very generously grate in some whole nutmeg. Toss in a couple handfuls of the raisins and thirty-two ounces of honey. 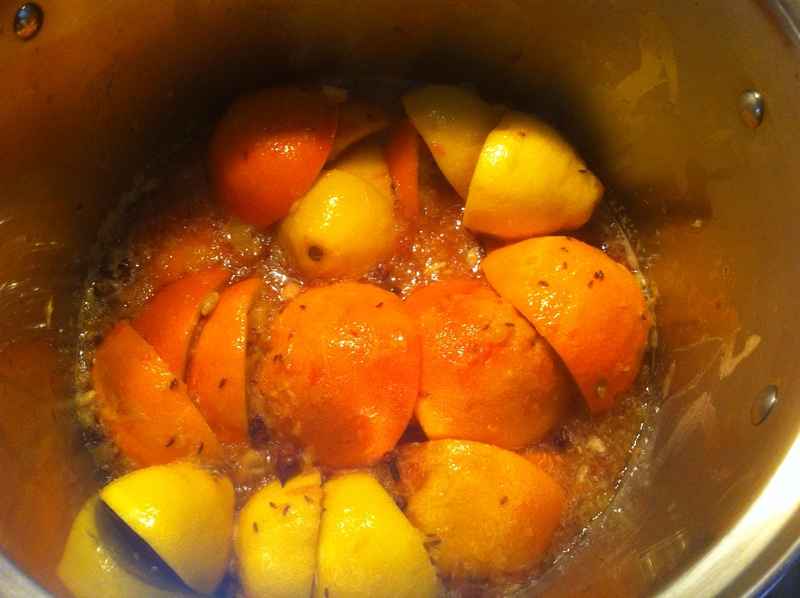 Simmer for several hours until the citrus is fairly well broken down. My husband, who is the expert, said anywhere from two to fours hours. 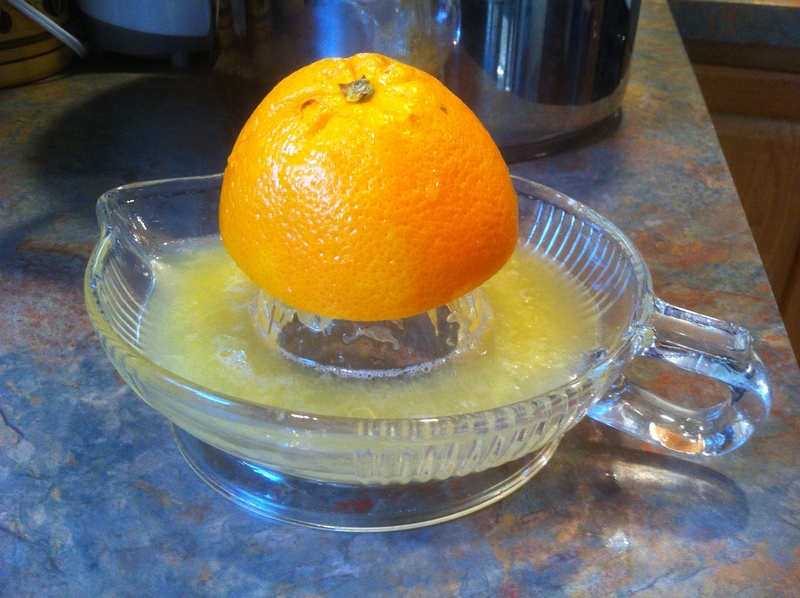 When done, strain and mash the fruit well to get out every last drop of juice. Now, add in Jameson to taste. Our batch, which amounted to about a half-gallon, has somewhere between four and five cups added in. We like a little kick! When my husband and I first met, he made the Boilo old school style with Four Queens. Since I am a Jameson snob, we switched it up. Try either, try both, whatever works for you! You can also skip the alcohol if you chose and have virgin Boilo. Enjoy warm in your favorite mug! Go easy, it is strong. Remember to share as well! We bottle it in pint size mason jars and give it out as Christmas gifts.